The Modern Art Museum of Fort Worth opened its new building, designed by the renowned Japanese architect Tadao Ando, to the public on December 14, 2002. 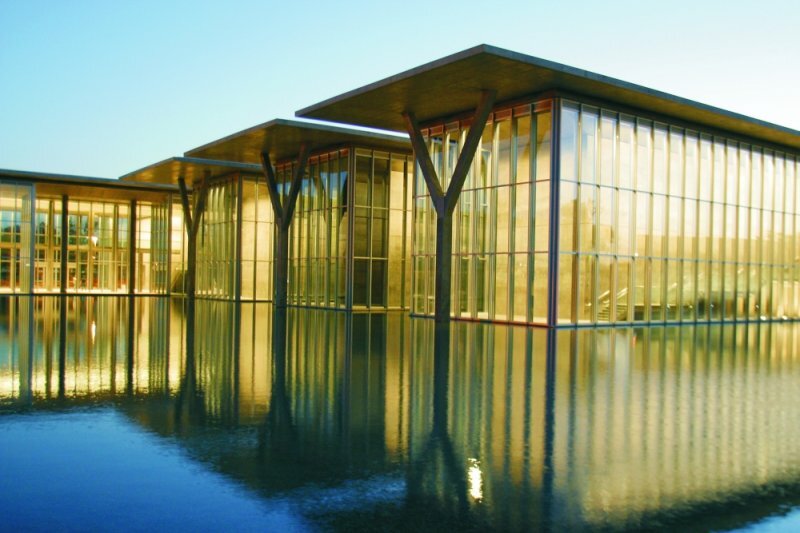 The new Modern is located in Fort Worth’s celebrated Cultural District, directly opposite the Kimbell Art Museum, designed by Louis I. Kahn, and near the Amon Carter Museum, designed by Philip Johnson. To date, the Museum is Mr. Ando’s largest project completed outside of Japan. It comprises five long, flat-roofed pavilions situated on a two-acre reflecting pond. The opening also celebrated the 110th anniversary of the Museum’s founding charter, which was granted in 1892 to the Fort Worth Public Library and Art Gallery. The Modern Art Museum is the oldest art museum in the state of Texas, and one of the oldest museums in the western United States. The establishment of the Museum’s first legal entity, the Fort Worth Public Library and Art Gallery Association, was due to the determination of twenty women who wished to bring culture to their burgeoning city. They secured a $50,000 donation from philanthropist Andrew Carnegie for a new building; construction began in the late 1890s, and the building opened in downtown Fort Worth in 1901. The Museum relocated to the city’s Cultural District in 1954, in a new building designed by architect Herbert Bayer. In the early 1970s, Texas architects O’Neil Ford and Associates designed an extensive new addition for the Museum, which reopened in 1974. A new Cultural District site was purchased for the Modern Art Museum in 1996 with a generous grant from The Burnett Foundation. In May 1997, Tadao Ando of Osaka, Japan, was chosen to design the new Modern Art Museum. Construction began in the fall of 1999, and the building was completed in August 2002. Tadao Ando’s design for the new Modern was the unanimous choice of the Museum’s Architectural Review and Long Range Planning Committee. A native of Osaka, Japan, Mr. Ando established Tadao Ando Architect & Associates in 1969. He has been a visiting professor of architecture at Yale University (1987), Columbia University (1988), and Harvard University (1990). A self-taught architect, he has been awarded the world’s consummate architectural prizes, including the Pritzker Architecture Prize, the Carlsberg Architectural Prize, the Royal Gold Medal of the Royal Institute of British Architects, and the American Institute of Architects Gold Medal Award. Mr. Ando’s work has been the subject of one-person exhibitions at museums throughout the world, including the Museum of Modern Art in New York (in 1991) and the Centre national d’art et de culture Georges Pompidou in Paris (in 1993). He received the Kyoto Prize in November 2002. Mr. Ando’s major architectural projects have primarily been located in Japan. The new Modern is his first large-scale public commission in the United States. Mr. Ando’s design for the new Modern Art Museum embodies the pure, unadorned elements of a modern work of art. Massive planar walls of architectural concrete boldly express the building’s basic structure while protecting the collection within. Forty foot-high transparent walls of glass framed in metal surround the concrete envelope, providing magnificent public circulation areas from which to view the building, the large reflecting pond, outdoor sculpture, and the landscaped grounds. The desire for diffused and reflected natural light within the gallery spaces was a major influence on the building’s design. Immense, cantilevered cast-concrete roofs shade the building’s exterior and accommodate the introduction of natural light into the gallery spaces by supporting sophisticated systems of continuous linear skylights and clerestory windows. Five forty-foot-high concrete Y-shaped columns support the concrete roof slabs. The Y-shaped columns and concrete roof are a magnificent achievement, and have become a much-admired and loved symbol of the new Modern. By day, the new Modern’s setting, on eleven naturally landscaped acres, including areas for outdoor sculpture and the large reflecting pond at the building’s edge, provides a restful complement to the Modern’s architectural strength. By night, when the concrete walls are bathed in an even glow of light, the transparent glass and steel galleries appear as large lanterns floating on and reflected in the pond. The Modern Art Museum maintains one of the foremost collections of postwar art in the central United States, consisting of more than 2,600 significant works of modern and contemporary international art. The new Modern features 53,000 square feet of gallery space, making it one of the largest museums in terms of gallery space in this country dedicated to modern and contemporary works of art. The simple modularity of the building’s design, combined with three double-height volumes that allow dramatic presentation of sculpture, results in a variety of gallery spaces. The building’s two levels permit the Museum’s curatorial staff to display works from the permanent collection on one floor while hosting a major traveling exhibition on another. The new Modern’s 5,600-square-foot Education Center includes one studio and two classrooms for hands-on art activities and lectures. To better accommodate the thousands of schoolchildren who visit the Museum each year, the Education Center is served by its own entry pavilion. This improvement keeps tour congestion away from the main entrance and provides adults attending evening classes with close, convenient access to the Education Center when the main entrance is closed. The Modern Art Museum’s auditorium facility comfortably seats 250 people and, due to the incorporation of an innovative acoustical design, is able to accommodate lectures, film festivals, and musical performances. The auditorium provides a great showcase for the Modern’s popular lecture series, Tuesday Evenings at the Modern, and provides a superb venue for other symposia and panel discussions. Combined with the adjacent 250-seat cafe, with its full-service kitchen and outdoor dining terrace overlooking the reflecting pond, the auditorium complex provides an exciting and convenient meeting and conference site for community and business groups.